NEW TO 2019…..WE ARE PROUD TO INTRODUCE……. Golf and my 9 year old son Ethan. Two things that are very near and dear to my heart, I am sure I don't have to specify which one comes first. 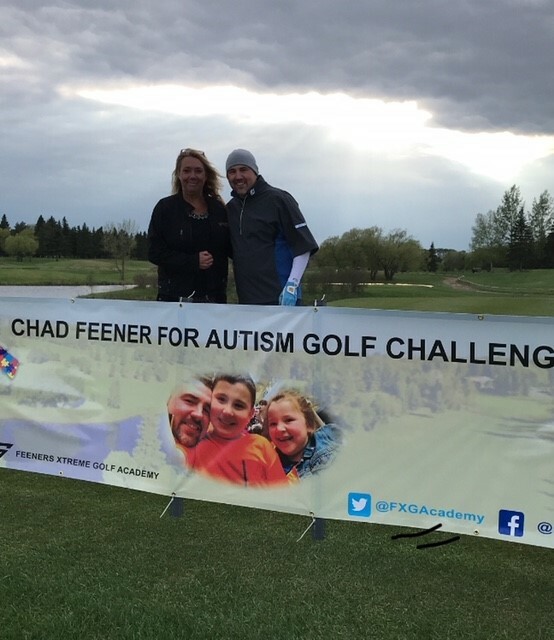 My goal in starting the FXG Academy was to promote Autism Awareness and to foster an environment that allows me to do what I do best, and that is promoting laughter and enjoyment inside the golf ropes while pushing the individual in the quest for lower scores and a better enjoyment within the game. Ethan is my beautiful 9 year old son, and he is on the spectrum. Thanks to a wonderful support group in Fort MacMurray he is well looked after and has the chance every day to learn and excel in his surroundings. I would very much like to see these kind of programs grow within the Leduc and Edmonton communities, and I consider FXG my small part in promoting this growth. I welcome you in your search to learn more about the FXG Academy and I encourage you to reach out to me whether it be to sign me on as your golf coach, see me about an instruction session, or ask about one of the many events I participate in to promote the FXG Academy. I would also like to invite you to check out the following organizations that I am proud to call partners. Every Sunday at the Leduc Golf Club from 6 am to 2 pm FXG ACADEMY will be stationed at a Par 3 on the golf course running a sponsored hole in one prize, proximity prizes and draw prizes. These contests are available for Leduc Golf Club Members and public players alike! All proceeds go to the FXG Academy and its goal of promoting Autism awareness.